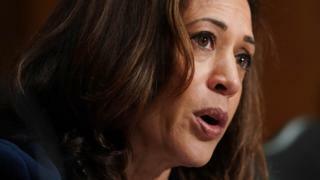 Image caption Kamala Harris called lynching a "dark, despicable part of our history"
The three black United States senators have introduced a bill that would make lynching a federal hate crime. The bill would allow lynching to be added as a hate crime charge alongside existing crimes such as murder. More than 200 anti-lynching bills have been introduced to Congress since 1918 only to be voted down, noted the bill's lead sponsor, Democrat Kamala Harris. "Lynching is a dark, despicable part of our history, and we must acknowledge that, lest we repeat it," she said. If passed, the Justice for Victims of Lynching Act would make lynching punishable by a sentence of up to life in prison. The bill is a bipartisan effort - Ms Harris and Mr Booker are Democrats while the bill's third sponsor, Tim Scott, is a Republican. "It's a travesty that despite repeated attempts to do so, Congress still hasn't put anti-lynching legislation on the books," Mr Booker said in a statement. "This bill will right historical wrongs by acknowledging our country's stained past and codifying into law our commitment to abolishing this shameful practice." According to the text of the bill, at least 4,742 people were reported lynched in the US between 1882 and 1968. It says 99% of all perpetrators of lynching escaped punishment. The House majority leader, Kentucky Republican Mitch McConnell, also indicated he would support the bill. "I thought we did that many years ago," Mr McConnell said earlier month in an interview with Sirius XM radio. "If we need one at the federal level, I certainly will support it," he said. The first anti-lynching bill was introduced to Congress 100 years ago in 1918, by Republican Representative Leonidas Dyer of Missouri. The bill passed the House but was opposed by Democratic senators from southern states and failed to pass the Senate. "Notwithstanding the Senate's apology and the heightened awareness and education about the Nation's legacy with lynching, it is wholly necessary and appropriate for the Congress to enact legislation, after 100 years of unsuccessful legislative efforts, finally to make lynching a Federal hate crime," the bill says.